It might seem impossible, but there are ways that you can spend less on food during your trip to Disney World, including coupons mixed with just plain travel smarts. 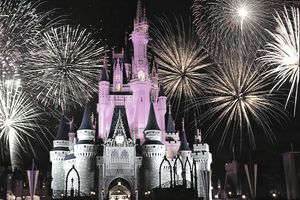 Plus, with some planning, you can even enjoy the more expensive Disney restaurants, without diving into your 401k plan. Here are 10 tips to help cut the cost of dining during your Disney vacation. Look for signs advertising that kids eat free when accompanied by a parent. Decide beforehand on where you plan to eat. Researching menus and prices ahead of time and pinpointing destinations for dining will save you both time and money when you're at the park itself. Packing your own snacks instead of buying a lot of fast-food items throughout the day will save you a considerable amount of money. It includes bringing refillable water bottles. Disney allows you to pack in food, although it must pass inspection before you enter the park. No alcohol is allowed, nor glass bottles, except for baby food jars. No plastic straws, either. If your hotel has a kitchenette or microwave and small refrigerator, stock up on breakfast foods, soups, deli meats and hot dogs and other microwavable foods. You'll cut your food costs drastically during your stay. Plan on eating a late lunch rather than an early dinner, and then snack in your hotel room later. Menu prices are lower at lunch. Large portions are normal for most restaurants. Bring along a lunch bag and zip-close plastic bags to easily store leftovers, which you can snack on later. If a restaurant is too expensive, but you still want to eat there for the experience or ambiance, go for coffee and dessert instead of a full meal. If you are staying in an All-Star Disney hotel, ask about purchasing the refillable mugs when you arrive. These mugs are refilled for free at hotel and park restaurants during the rest of your stay. Browsing through Epcot's international dining options is not only fun but also offers you a chance to try a variety of foods without going through the more expensive sit-down restaurant experience. It's economical, and you'll enjoy different foods from what you always eat at home. Restaurant coupons. For coupons at restaurants around the Disney area, browse the offers at Restaurant.com. You can find certificates from up to 50 percent off your bill. Entertainment Book. Along with receiving a book of coupons, you can sign up for a "Savings Subscription," which allows you to view and print coupons online. A monthly subscription ensures that you are getting the best selection and most current coupons available, and it is ideal for vacation planning. To view how it works, go to Entertainment Book and type in the zip code 32830 to see the valuable coupons available in the Disney World area. Pre-Paid Dining Plan. There are discussions on Disney forums regarding the advantages of the Pre-Paid Dining Plan. This plan is sold as an extra to a package deal purchased at a Disney Resort Hotel. Many feel that a prepaid plan is not worth the savings since it requires that you use all vouchers in your plan to benefit from it. There are no cash-back offers for unused vouchers, and if you lose them, they are hard to replace. Also, they are only valid inside the theme parks and cannot be used at some of the best restaurants at the resort. Enjoy Florida Magazine. This magazine offers several coupons for many of the attractions and restaurants in the Orlando area. Visit Orlando Deals. Search this site to find Orlando’s best offers on hotels, attractions, restaurants, and shopping. It replaces the Orlando Magicard that used to be offered by the VisitOrlando visitors' center. Now get those mouse ears on and go have some fun! Easy Ways to Order Pizza on the Cheap! Print Restaurant Coupons and Join The Clubs and Start Eating for Free!